One of the best features of iOS is Photo Stream, an iCloud connected service that allows users to upload pictures to be shared in an album only select friends and family members can view. Android, though it now has Google+ backup of photos, still doesn’t feature an easy medium for friends and family members to upload pictures into one album. Adobe Revel, which has been on iOS for three years now, looks to fix this by coming over to Android with a nifty suite of features. The main purpose of the app is to back photos up privately and only allow certain people to access them, much like Photo Stream. A practical use case would be at a family gathering, where everyone with a smartphone can take their own pictures and upload them to be privately seen by each other. Another feature is the ability to edit pictures after they’ve been uploaded using the service, which can be handy if you want someone else to edit your pictures for you using the service. You can manage who has which permissions in one of these Group Libraries, though, so your friends don’t go crazy deleting and editing photos. Invite friends and family to join a Group Library, where you and your inner circle can create a huge collection of everyone’s photos and videos. You control who can view, add, organize, and edit the memories in a Group Library. Create albums to keep your photos and videos organized. Share albums with loved ones in private web galleries. Share photos and videos on your favorite social networks. Edit your photos to make your memories look their best. 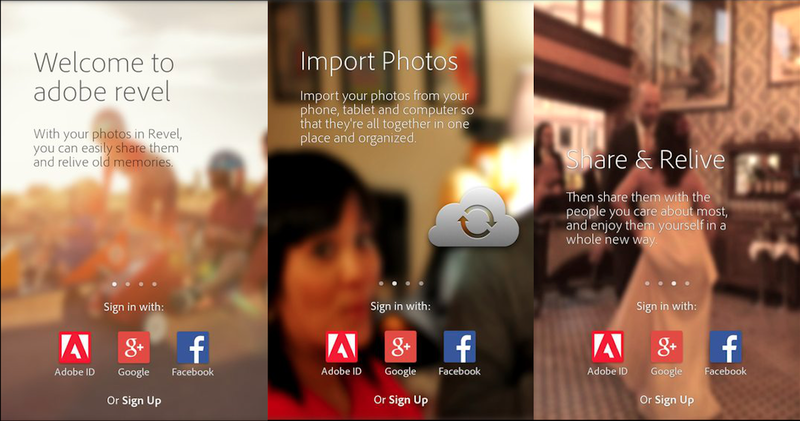 Adobe Revel is available for free on Google Play, so go give it a whirl and let us know what you think.